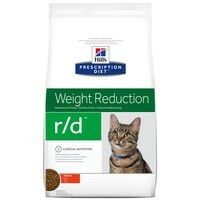 Hills Prescription Diet RD Weight Reduction Dry Food for Adult Cats has been specifically designed for the nutritional management of obese or overweight cats with the aim to reduce body mass. Even a little extra weight can impact the quality of your pet’s life, and by using Hills R/D you can help your cat metabolise fat, maintain lean muscle and provide them with all the nutrition they need as they lose weight. Hmm....my cat is a rescue cat too & has begun to get a little heavy (!!) This is an excellent product that really works & seems to be tasty. I always buy all my dog/cat food from VetUK as its so much cheaper than anywhere else & the delivery is ultra fast! Isn't that interesting that two of the comments are about obese rescued cats. I would like to add that my cat is a rescued cat too! He must have been so starving in the wild and then spent another 7 months in a hutch in the animal shelter. When I collected him he just wanted to eat and had no mechanism to know when to stop. I have another rescued cat who wasn't so long in the shelter. She is as thin as a whippet and only eats what she needs. Recommended by my vet for our two rescue cats who can only be bribed by food and were in danger of becoming rather podgy. He still reckons they are too plump, but I think they're just the right size! But they love r/d and it's certainly keeping them trim(ish). Brilliant product, recommended to me by the vet. My overweight cat enjoyed eating it just as much as he enjoys the Hills Science Plan dry food. Within a few weeks the excess weight had dropped off him and he was back to his sleek, streamlined self with lots of energy! This product really works. Initially recommended by the vet for our fat rescue cat, it has helped him to lose over 2Kilos. He'll never be a thin boy but this has stabilised his weight and best of all, he enjoys it.